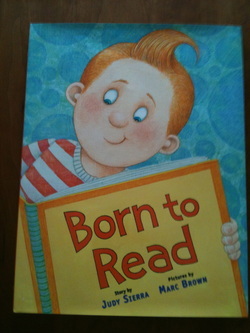 As soon as your child is born you can begin to introduce literacy into their lives. Children learn from what you say and what you do. It has been said often that "You are their first teachers." Oral language skills grow as children hear language spoken. They also learn vocabulary words and begin to understand oral language through books that are read to them. Here are some ways to increase oral language and vocabulary. Have a conversation with your child. Make sure to speak in complete sentences and encourage your child to respond in a complete sentence. "Yes" or "No" responses give you information, but do not give your child practice in using language to express themselves. Reading stories aloud to your child are other ways for children to lean how language works and also to learn new vocabulary. Read as much as possible with your child. Reading books to your child is also a way to focus on vocabulary and comprehension. Tell your child what an unfamiliar word means. Young children LOVE learning new words For example, if the text uses the word "famished" say "famished" is another word for very hungry. To follow-up, you could say, 'I was so famished I thought could eat a whole pizza by myself." Have you ever been famished? The way I demonstrated teaching the new vocabulary word tells the child again what the word means when it is used in a sentence. Asking the child the question "When were you famished?" gives the child an opportunity to engage in a conversation with you. Children need to use a vocabulary word at least ten times before they own that word. Another idea, after reading a book to you child, ask what was your favorite part? Was there a person or animal (or character) in the story that you liked? You can also ask why? But, that's a more sophisticated question and younger children may not be able to articulate an answer. If you take your child grocery shopping, have a conversation with your child in the store. You can point out different fruits and vegetables, for example and teach their names. Ask your child to count how many are green. Share with your child the foods you like to eat or don't like to eat. Show them the foods. Have a discussion. Remember the best part of a conversation is when everyone has the opportunity to speak and listen.